Lawyers, barristers, magistrates, politicians, police superintendents, detectives, their families and their prisoners were photographed by Thomas J. Nevin from the late 1860s to the 1880s. 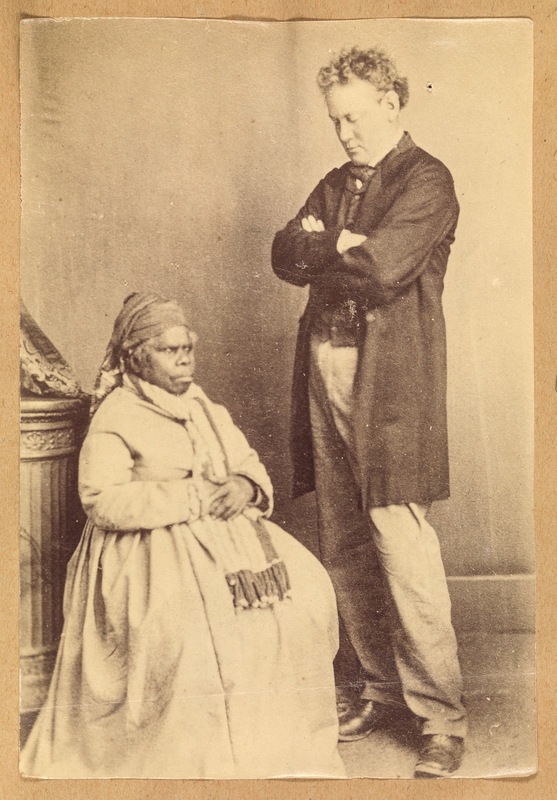 As government contractor from 1868 to the legal fraternity and the Hobart City Council, Thomas Nevin’s photographs of people are especially interesting because of his access to all social classes of the British colony of Tasmania which he had entered in 1852 as the ten year-old child of soldier, journalist, teacher and poet, John Nevin snr. 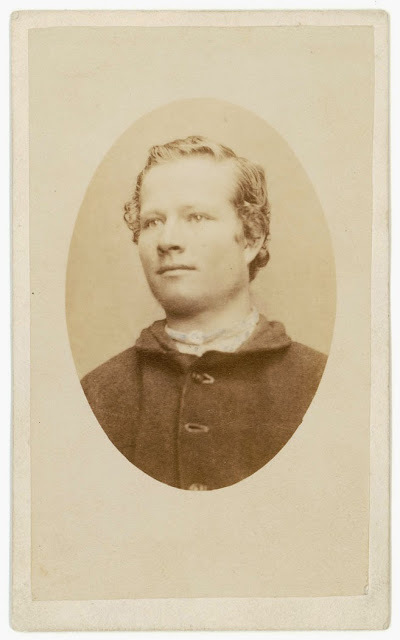 Several photographs taken by Thomas Nevin of the families of government official Lukin Boyes, barrister Robert Byron Miller, and solicitor John Woodcock Graves jnr, of Caldew, West Hobart, have survived in public and private collections. 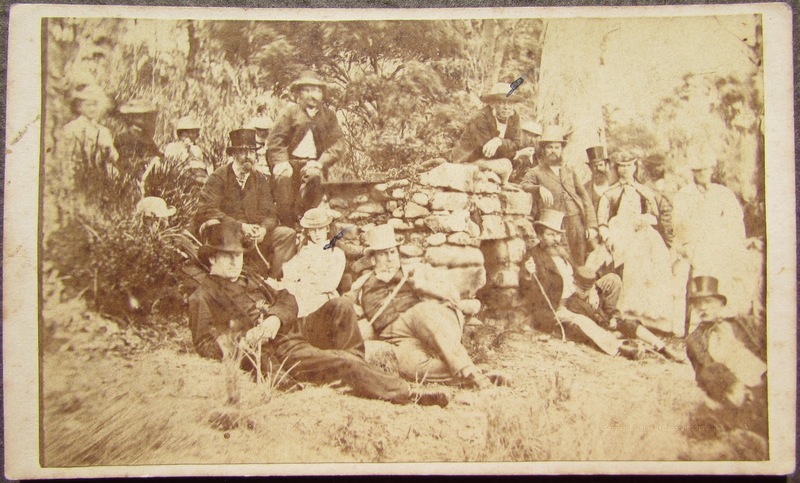 This group was photographed at Adventure Bay on 31st January 1872. One copy is held at the Tasmanian Museum and Art Gallery. 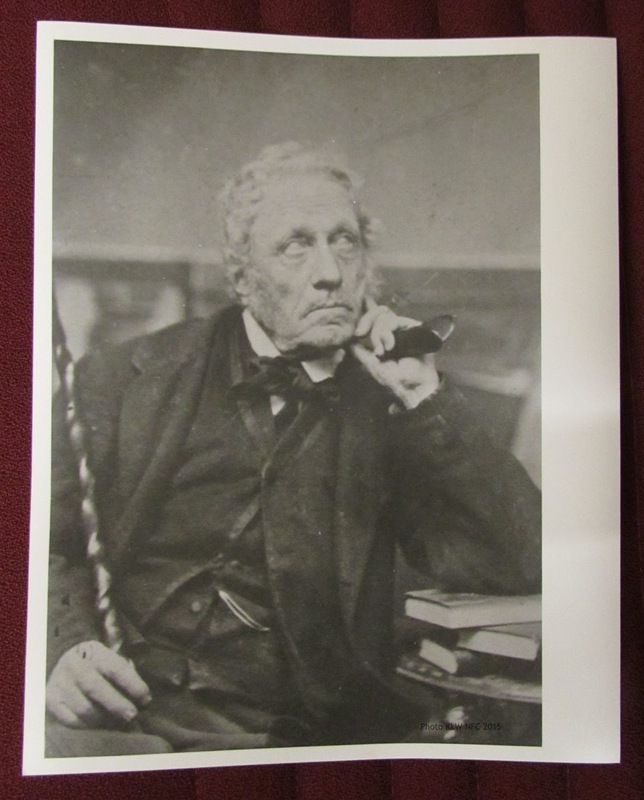 Another copy was retained in a family album by Jean Porthouse Graves, the eldest daughter of John Woodcock Graves jnr. who is pictured reclining at extreme lower left. One of four extant photographs taken on 31st January 1872 and printed in various formats from Thomas J. Nevin’s series advertised in The Mercury, 2nd February, 1872, as the Colonists’ Trip to Adventure Bay (Bruny Island). Verso: One of four extant photographs taken on 31st January 1872 and printed in various formats from Thomas J. Nevin’s series advertised in The Mercury, 2nd February, 1872, as the Colonists’ Trip to Adventure Bay (Bruny Island). Thomas Nevin reprinted this group photograph of John Woodcock Graves jnr and company as an oval stereograph on a buff mount, with his blindstamp impress on recto at centre between the two images. This copy is held at the Tasmanian Museum and Art Gallery. Frederick Lukin Boyes: the boy seated on the grass who died in 1881, aged 16 yrs, son of Lukin Boyes. Lukin Boyes, Customs Officer: the man seated on right in light clothing who is patting a goat or deer. Jean Porthouse Graves (born 1858): the teenage girl sitting next to Lukin Boyes, daughter of John Woodcock Graves jnr (not pictured here). Robert Byron Miller, barrister: sitting on the same bench, whose son Francis Knowles Miller later married Jean Porthouse Graves. Two more of John Woodcock Graves four daughters: the two other girls, one sitting on a chair at extreme left, and the other seated on the grass, were possibly Mimi (born 1862), Trucanini (1864) or Mathinna (born 1859). The latter two were given Aboriginal names at birth. Two tall thin metal statues of a beggar and a harlequin flank the group on either side. Their significance and provenance is not known. Perhaps they were cast by a local sculptor for private decorative use, or they may have featured as props in a theatrical production, or even confiscated by Lukin Boyes at the Customs and Tariff Office. But it is the lion statue in the foreground which is the focal point of the image. It belonged to John Woodcock Graves’ family of Caldew, West Hobart. A later photograph taken of Jean Porthouse Graves ca. 1877 shows it placed near the doorway of the house (see below). 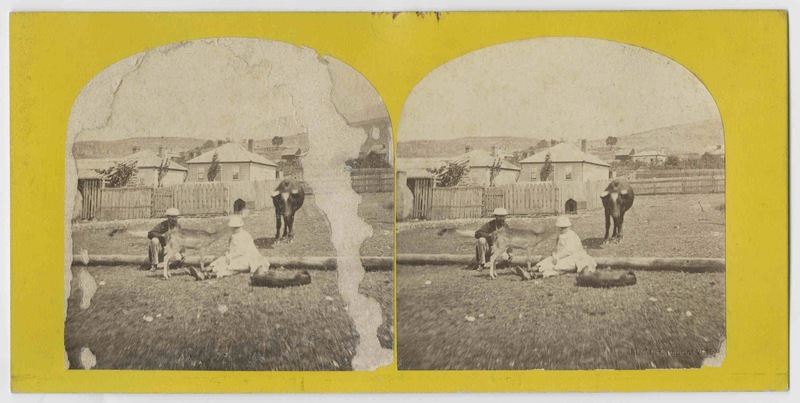 This stereograph taken by Thomas Nevin and the one immediately below it were possibly taken on the same day, ca. 1870 and in the same location, at the back of Caldew when West Hobart was still a sparse “wilderness” (see newspaper accounts below). 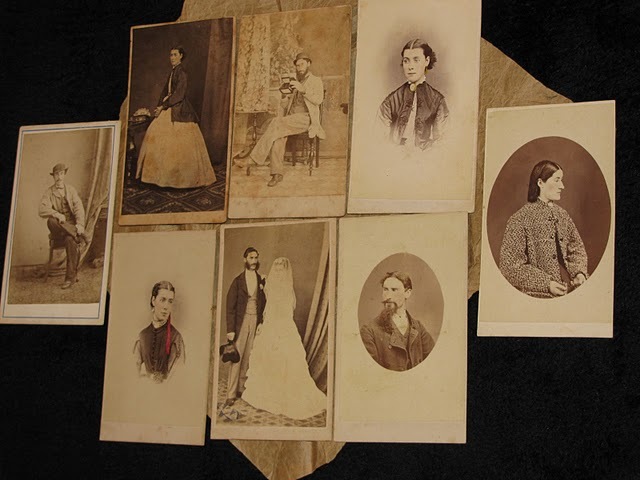 Verso: Group portrait of two male adults, one boy and three girls, members of the Graves, Miller and Boyes family taken by Thomas Nevin ca. 1870 at Caldew, West Hobart. The back of the photograph above was stuck to the front of this photograph below, i.e. the stereographs had been kept one on the top of the other, front up. When someone separated the top one from this one placed underneath, they tore off a strip of the left hand image, notably the detail of a house in the background. 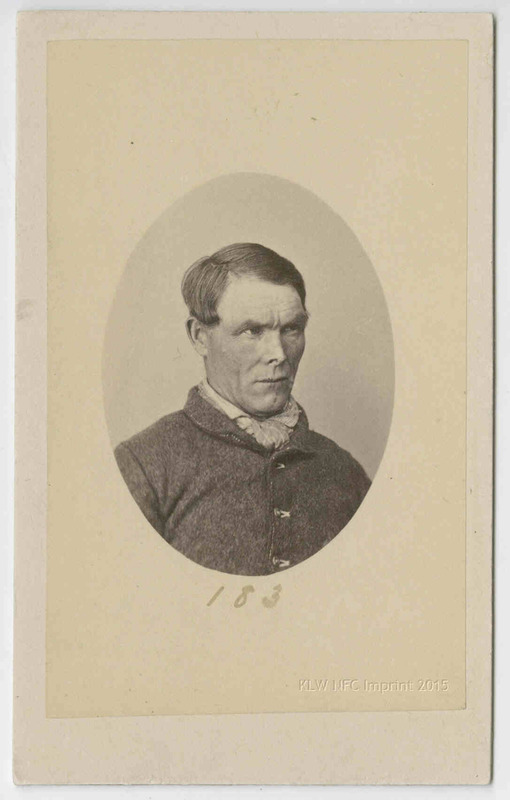 Both photographs feature the same man in a white hat, probably R. Byron Miller, and because they were stored together, they were most likely taken on the same day and in the same location. As above, Robert Byron Miller again in a white hat and one of the daughters of John Woodcock Graves, possibly Jean Porthouse Graves, seated on a log, at the back of some cottages with a deer, a cow and a dog. The deer licked her face and the dog rolled just as Nevin took the photograph, resulting in a blur. 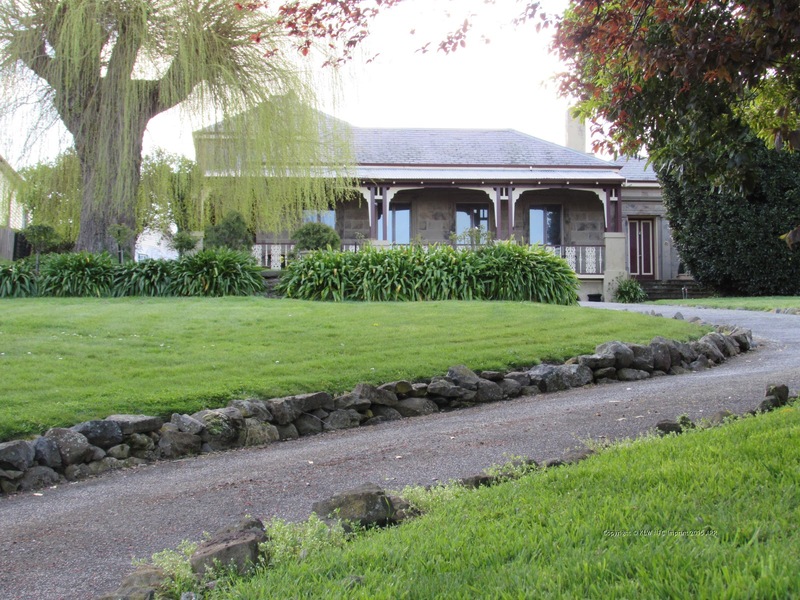 The location is possibly the back garden of Caldew, West Hobart. 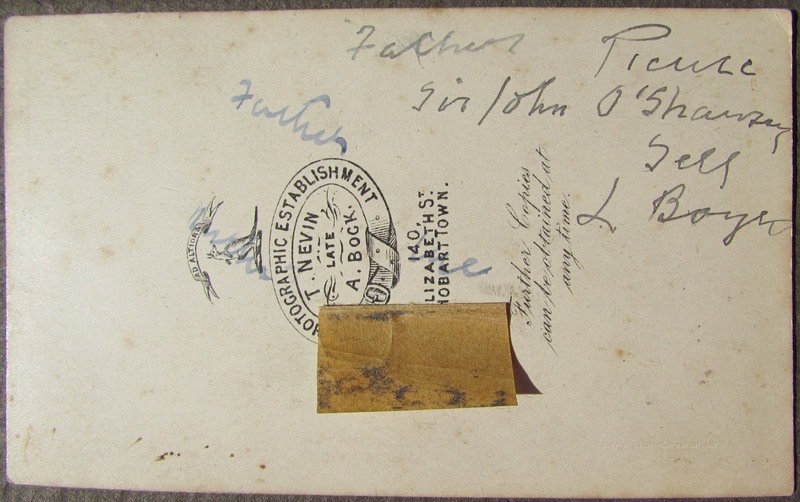 A semi-circular remnant of the front of the stereograph below (TMAG Ref: Q16826.21) has stuck to the verso on separation. Verso: Robert Byron Miller again in a white hat and one of the daughters of John Woodcock Graves, possibly Jean Porthouse Graves, seated on a log, at the back of some cottages with a deer, a cow and a dog. The deer licked her face and the dog rolled just as Nevin took the photograph, resulting in a blur. The location is possibly the back garden of Caldew, West Hobart. 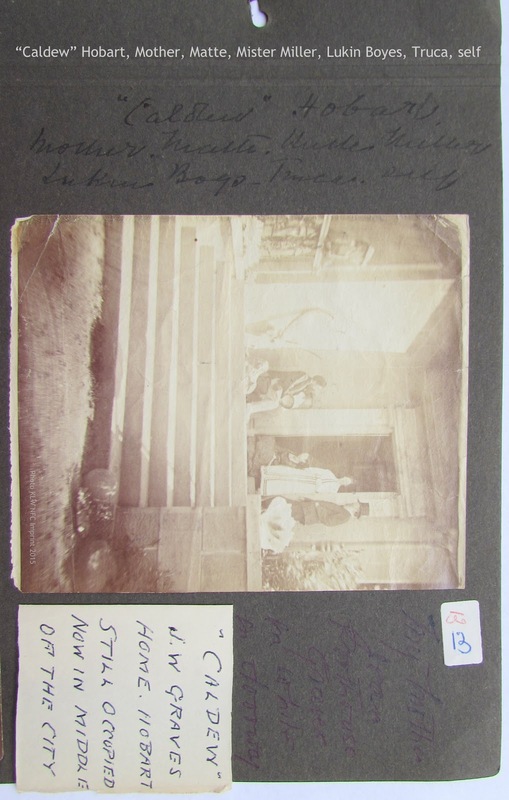 A semi-circular remnant of the front of the stereograph below (TMAG Ref: Q16826.21) has stuck to the verso on separation. Included in Jean Porthouse Graves’ family album is this photograph of the same location as the stereograph above, showing a wider view of the cottages and the paddock where Thomas Nevin had photographed Byron Miller with one of the Graves’ sisters, together with the deer, the cow and the dog. 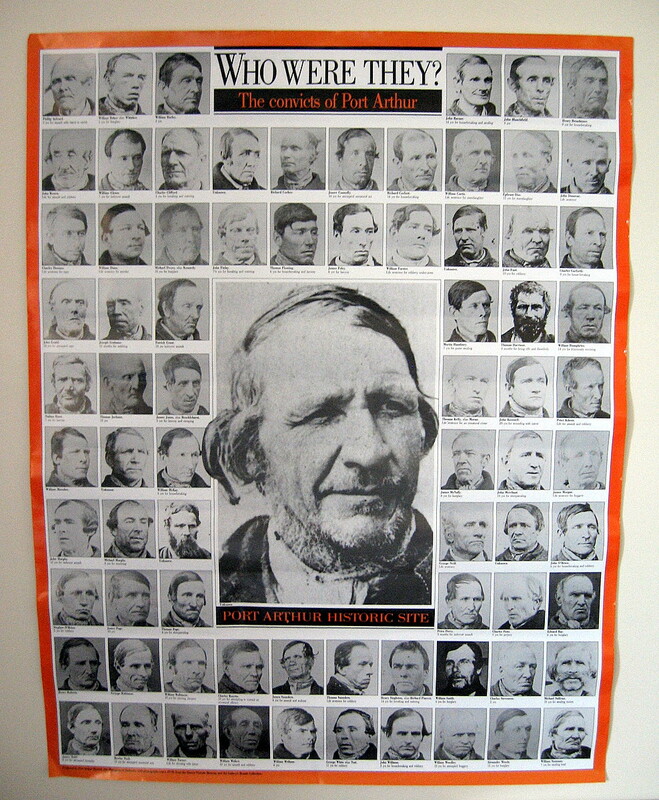 Jean Porthouse Graves had pasted this photograph into her album with the words ” Raw country original photograph arrival convicts”. 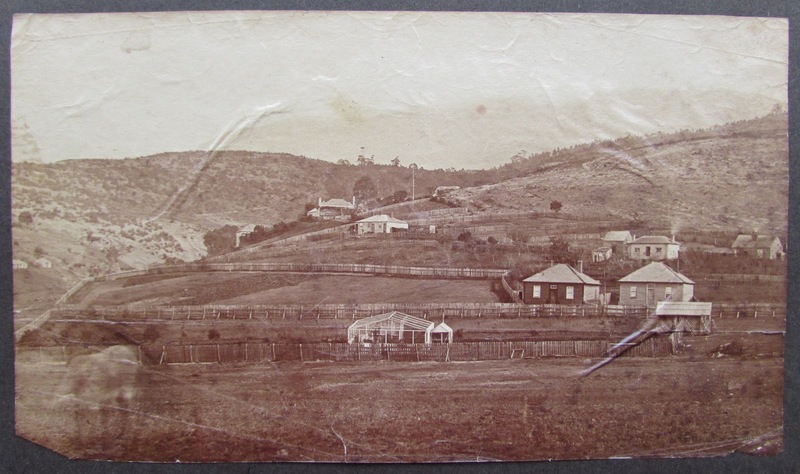 This photograph was taken at some distance, giving a view of the hills and one or two substantial residences, but the cottages in the foreground are the same, and the animal enclosure at the corner of the fence, visible in the stereograph above, is discernible at lower right. Here again is the lion sculpture greeting visitors on the steps of Caldew, first photographed by Thomas Nevin ca. 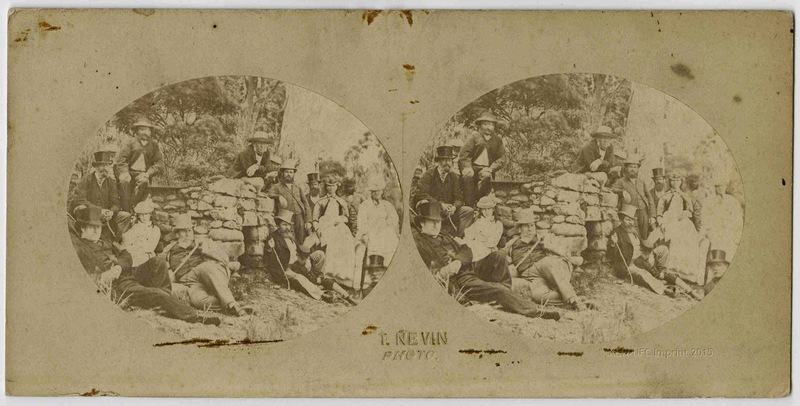 1870 as a stereograph (above) with Byron Miller, Lukin Boyes, Frederick Boyes, and sisters Jean, Matte, and Truca Graves. 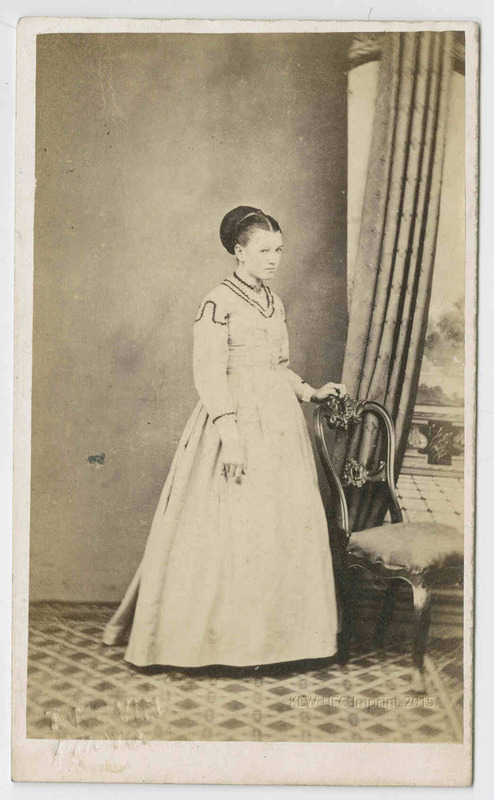 This photograph (below) was taken of Jean Porthouse Graves about seven years later, noted as “self” along the edge of the page on which it was pasted in her family album. She stood in the doorway of Caldew ca. 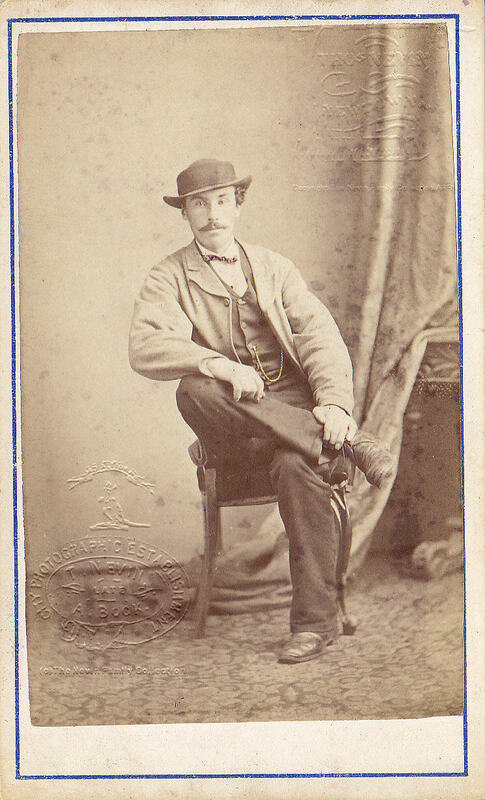 1877, gazing directly at the photographer. Her father, solicitor John Woodcock Graves jnr by this time was deceased. 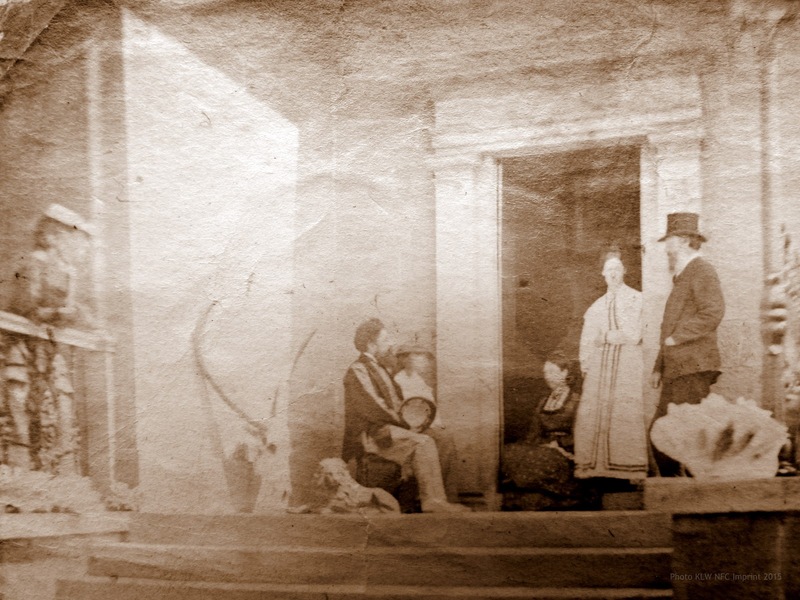 He had died suddenly in 1876 of congestion of the lungs and pneumonia, leaving a widow, pictured here seated in the doorway and four daughters. Listed as present here by Jean are two of her sisters, Trucanini (Truca) and Mathinna (Matte), with their father’s former colleagues R. Byron Miller standing next to Jean, and Lukin Boyes, seated with one of the Graves’ daughters. Lukin Boyes was a witness at the marriage of John Woodcock Graves to Jessie Montgomerie in 1857. 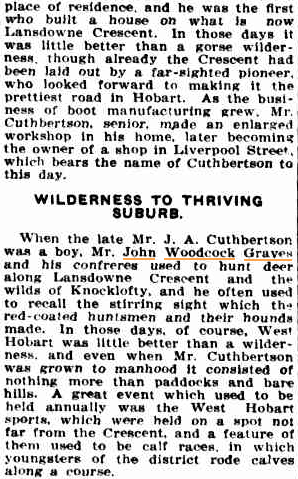 During the early to mid 1900s the Mercury published a series of reminiscences of former residents at West Hobart who not only commented on the wilderness aspect of the area during the time the family of John Woodcock Graves jnr lived at the house he built there, named Caldew, they also remembered the sporting events he mounted, the native animals and the deer he brought to the property, and the relics of colonial times amassed by old Mr John Woodcock Graves senior, renowned as the author of the song “D’ye Ken John Peel”. Mr. Gourlay has a retentive memory, and recalls many features of old Hobart. “In my early days,” he said in an interview, “the Lansdowne Crescent district was an open space. Only about 11 houses could be seen, the principal ones being that of Mr. Piguenit, the father of the well-known artist, and Caldew, where lived the lawyer, J. W. Graves, son of the poet, John Woodcock Graves, who lived in Forest Road, and whom I knew well. 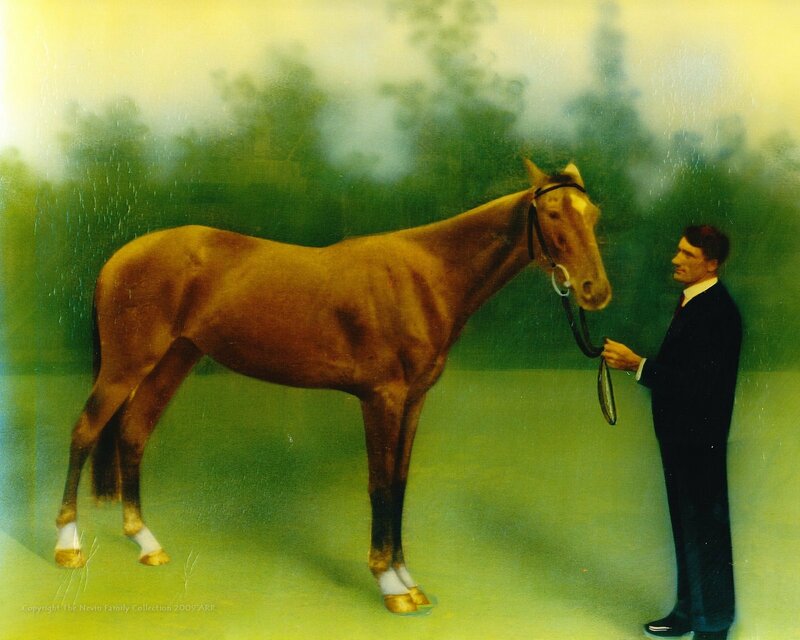 I remember when the lawyer Graves, with Walton and Whitton conducted horse racing on his property. John Woodcock Graves snr, author of the song “D’ye Ken John Peel”. When the late Mr. J. 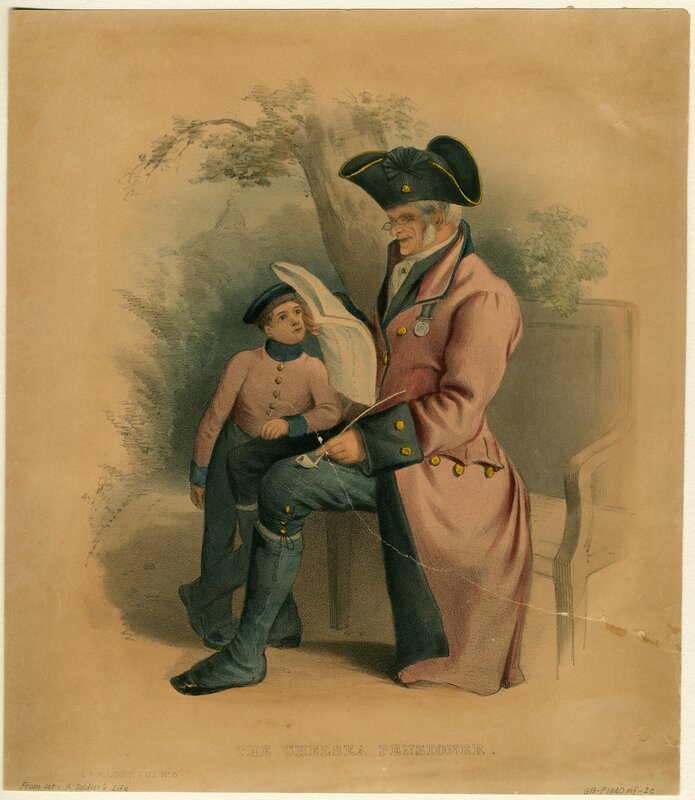 A. Cuthbertson was a boy, Mr. John Woodcock Graves and his confreres used to hunt deer along Lansdowne Crescent and the wilds of Knocklofty, and he often used to recall the stirring sight which the red-coated huntsmen and their hounds made. In those days, of course, West Hobart was little better than a wilderness, and even when Mr. Cuthbertson was grown to manhood it consisted of nothing more than paddocks and bare hills. A great event which used to be held was the West Hobart sports, which were held on a spot not far from the Crescent, and a feature of them used to be calf races, in which youngsters of the district rode calves along a course. 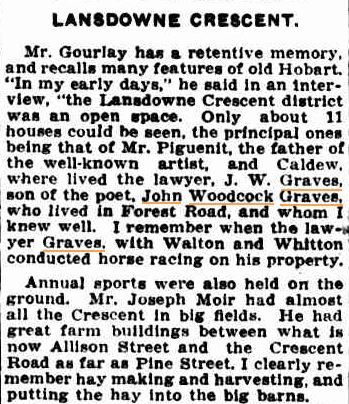 For some years Graves lived with his son, J. W. Graves, solicitor, at Caldew, Cavell Street, West Hobart, now the home of ex-Alderman J. A. Cuthbertson. 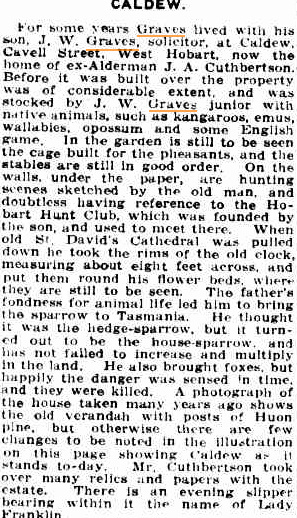 Before it was built over the property was of considerable extent, and was stocked by J. W. Graves junior with native animals, such as kangaroos, emus, wallabies, opossum and some English game. In the garden is still to be seen the cage built for the pheasants, and the stables are still in good order. On the walls, under the paper, are hunting scenes sketched by the old man, and doubtless having reference to the Hobart Hunt Club, which was founded by the son, and used to meet there. When old St. David’s Cathedral was pulled down he took the rims of the old clock, measuring about eight feet across, and put them round his flower beds, where they are still to be seen The father’s fondness for animal life led him to bring the sparrow to Tasmania. He thought it was the hedge-sparrow, but it turned out to be the house-sparrow, and has not failed to increase and multiply in the land. He also brought foxes, but happily the danger was sensed in time, and they were killed. 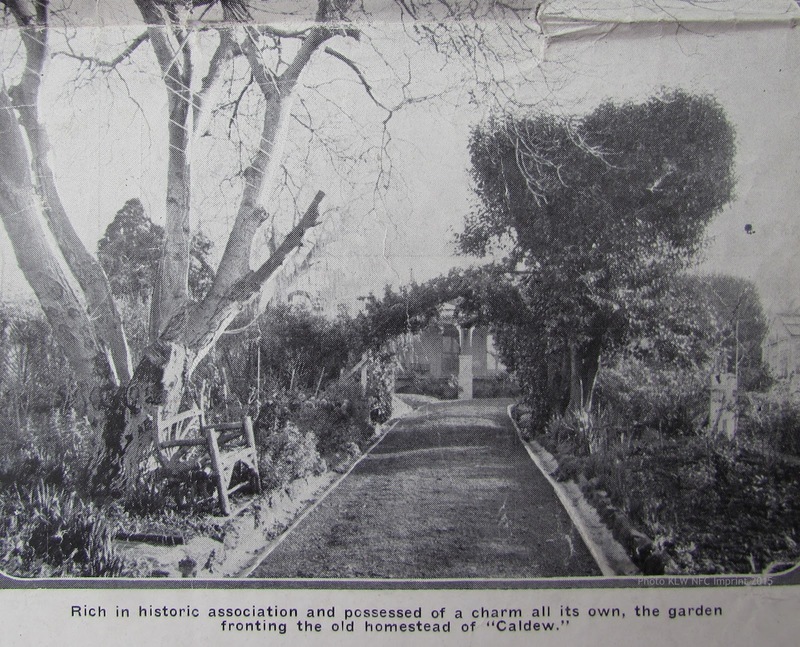 A photograph of the house taken many years ago shows the old verandah with posts of Huon pine, but otherwise there are few changes to be noted in the illustration on this page showing Caldew as it stands today. Mr. Cuthbertson took over many relics and papers with the estate. There is an evening slipper bearing within it the name of Lady Franklin. 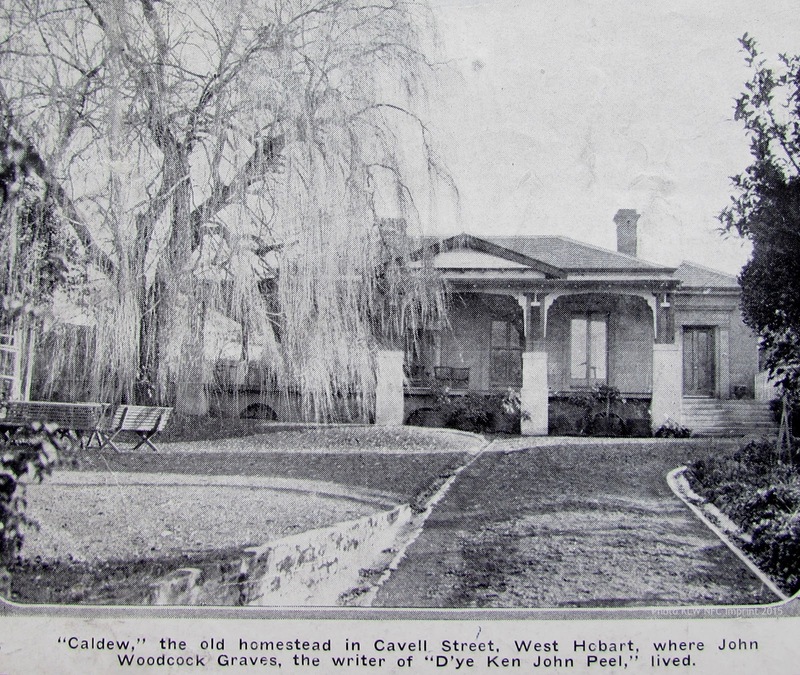 Photographs published in the Tasmanian, 1920s, of the house, Caldew, at Cavell Street, West Hobart, built by John Woodcock Graves in the 1860s. Photos copyright © KLW NFC Imprint 2015 Private Collection. This is an enduring image of Tasmanian Aboriginal woman Truganini (var. 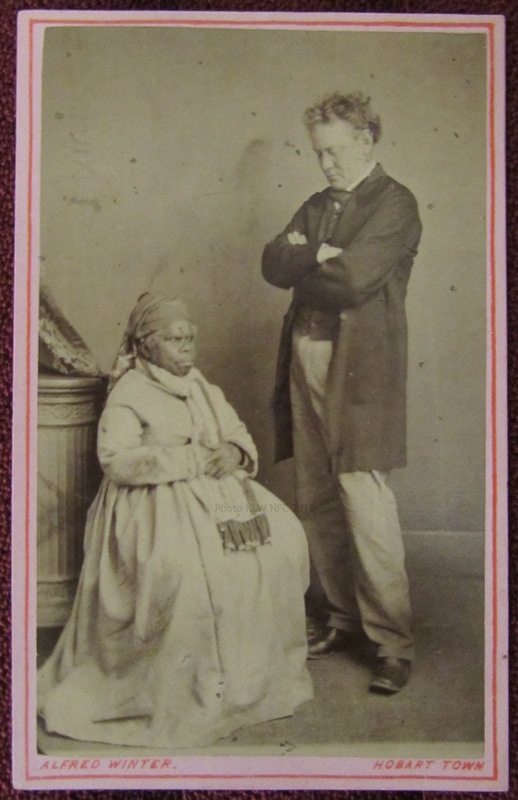 Trucanini) photographed with John Woodcock Graves jnr shortly before her death, aged 73 yrs, on 8th May 1876. He died six months later, aged 47 yrs, on 30th October 1876.